Romero – Scientific name: Ros marinus officinalis L.
Romero is cultivated in some places in the Philippines. It is used as condiment in flavoring and also for preserving meat. Romero is reported to fight bacteria, relax the stomach, stimulate circulation and digestion, act as an astringent and decongestant, and improve circulation to the brain. It is reported to help prevent liver toxicity, and have anticancer and anti-tumor properties. Vapor baths, using 30 to 40 gms of leaves in boiling water for rheumatism, catarrh. 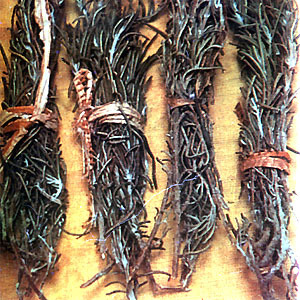 Juice of leaves applied to areas of thinning hair and dandruff; also, as rosemary vinegar. Infusion of leaves as tea for dyspepsia, flatulence. Decoction of leaves as mouthwash for gums disease, halitosis, sore throat. Cough: Inhale steam of strong decoction of herb. Diuretic: Take decoction of herb as needed. Gas pains: Take decoction of herb as needed. Rheumatism: Make decoction of herb and soak affected area. Conjunctivitis: Infusion of leaves used as an eyewash, 4 to 5 times daily. Infusion with oil for massages. Daily use of rosemary tea believed to prevent cataracts. For Hair wash: Steep 25 g of rosemary in 2 pints of cider vinegar for two weeks, shaking occasionally; strain. In hair washing, put 1-2 tsp in the final rinse. As hair restorer, romero is macerated in alcohol and rubbed on twice daily. The hair lotion is suppose to stimulate the hair bulbs to renewed activity and prevents baldness. For dandruff, massage rosemary vinegar thoroughly into scalp, 20 mins before washing. Used as antispasmodic in renal colic and dysmenorrhea. Decoction of leaves used as carminative and as an abortive. Infusion of leaves used for gastralgia, dyspepsia, flatulence and palpitations. In Mexico, a 2% infusion of leaves or its essence (6 drops every 24 hours) is considered stomachic. Volatile oil used as stimulant in liniments. This entry was posted in List of Medicinal Plants in the Philippines and tagged romero, rosemary on March 27, 2009 by Pinoy Herbs. Hi there, I found your blog via Google while searching for acne information and cures and your blog’s been a welcome read. I will be bookmarking your blog for later.